Since 1989, Dr. Loco's Rockin' Jalapeno Band has been playing a rich melange of mestizo and mulatto styles in celebration of the diverse origins of their Mexican-American musical heritage. Based in San Francisco, this award-winning band transmits the joy inherent in this mus?ca and the pleasure they feel making it. Led by multi-instrumentalist and anthropologist Jose Cuellar, Ph.D. (a.k.a. Dr. Loco himself! ), the Rockin' Jalapenos have played for prominent events all over the nation. Combining his wide-ranging artistic and academic experiences, Jose also presents powerful lecture demonstrations, performance workshops, master classes, question-answer sessions, and keynote addresses concerning Chicano & Latino music, culture, history, ethnicity, aging, acculturation, and education. Cuellar's motivating presentations to diverse audiences entertain and educate, as well as promote critical thought and personal pride. Jose Cuellar is widely recognized as a successful Chicano musician and dedicated ethnic studies educator. 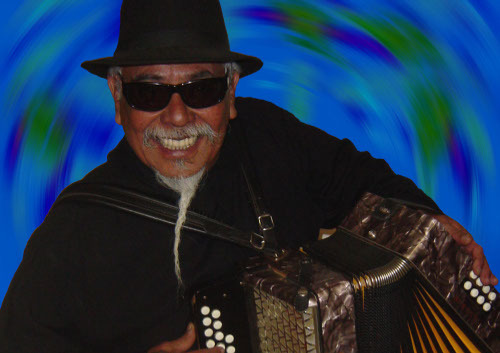 Over the past two decades, he has gained international recognition as an exciting performer, and with his group, Dr. Loco's Rockin' Jalapeno Band, has produced four critically acclaimed music albums: Con/Safos, 1991; Movimiento Music, 1992; Puro Party!, 1995; and Barrio, Ritmos & Blues, 1998. Cuellar earned a 1968 A.A. in music from Golden West College, a 1969 B.A. in anthropology from California State University Long Beach, and 1971 M.A. and 1977 Ph.D. in anthropology from the University of California at Los Angeles.